As Eva points out, clogs are a great shoe choice for people who stand on their feet all day. Only problem is, most clogs are too wide or deep for many people’s feet. It doesn’t matter whether your foot is shallow or narrow or both, you still need a lower volume clog than the typical ones sold. If this is a problem you’re having you can always try the narrow Dansko clogs, which are much more shallow than the regular ones. 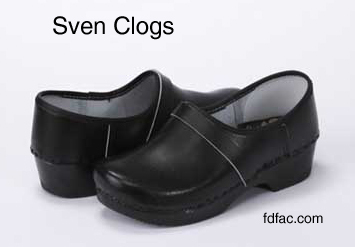 Another choice are Sven clogs http://svensclogs.com/index.html, which beat Dansko hands down for a narrow and shallow fit. Even better, with Sven clogs, you can customize the fit and look including base, color of leather and upper. A lot of people aren’t aware that the footbed of a shoe can go a long way to impart stability or cushioning. If your shoe has a removable sock liner, the footbed is the structure below the sock liner. Typically there are 3 main types of footbeds. 1. Slip lasted – No additional stiffener added to shoe. Identified by a stitched seam either around the sides or down the middle of the insole. This method allows for the most cushioning and flexibility. 2. Strobel lasted – Same as above with a thin, soft full length insole. This allows for a more stable (anti-pronation) shoe. 3. Combination lasted – A 1/2 and 1/2 mixture of the above. Forefoot – slip lasted, heel area – Strobel or (card) board lasted. This provides rearfoot stability with a cushioned forefoot. When considering the overall structure, the footbed is only one component of stability, you also need to take into account the outsole composition. You can have a firm footbed and a soft midsole and the shoe will overall be soft. Conversely, you can have a soft footbed and a firm midsole and the shoe will overall be firm. The goal is to start getting you familiar with shoe construction, so that you will eventually be able to match the construction to your particular foot. It all depends on whether or not you are having problems. If your foot is just flat, than a motion control or certainly a wider outsole shoe would be recommended for you. Motion control shoes usually have a firm heel counter (non-collapsible) a stiff footbed below the sock liner and a firm EVA midsole, which are all designed to prevent excessive pronation (foot collapse inward). What a motion control shoe may or may not have is a stable upper, which is also necessary for proper support and pronation control. If your podiatrist determines you need an orthotic (excessive pronation), a motion control shoe can help, but you will still need the orthotic. Don’t worry about the shoe and the orthotic causing supination (turning outward) as the combination won’t have that effect. Worst case scenario, you will have more control than you need, but this shouldn’t be a problem.